Be sure to bring in the whole family. Make your reservation (817) 251-0999. 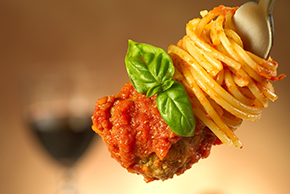 Cafe Italia is the home to fine Italian dining at an affordable price for the entire family. Bring in your loved ones and friends and enjoy some of the finest lunch and dinner cuisine available in the Grapevine, TX region. We promise you’ll leave satisfied every time you stop into our restaurant. Patrons are offered wonderful choices for the best foods around, with recipes straight from the Italian homeland and ingredients from the freshest of markets. Our professional staff will make you feel welcome and comfortable upon your arrival. The Grapevine, TX community’s happiness is our number one priority so we pride ourselves on treating each customer as if they were family. We strive to create the type of environment you want to come back to over and over again, not just once for a special event. Cafe Italia is the type of restaurant you can bring the whole family to each weekend and never grow tired of the incredible atmosphere, the tasty foods, and the helpful staff. If you’re looking for something a little larger, we can also accommodate corporate events, wedding dinners, birthdays, and other gatherings in one of our two separate dining rooms. Both rooms seat a good amount of people, with the smallest holding 10 to 40 patrons and the largest holding 10 to 60 patrons. When combined with our excellent service and we’re sure you’ll experience a night to remember for quite some time. And don’t fret on the bill. We offer a variety of payment options for your dinner or lunch. Customers can pay using Visa, MasterCard, American Express, or even Discover. The variety allows our customers plenty of easy payment choices when planning their evening. Be sure to bring in the whole family for a get together at Cafe Italia. As the finest Italian dining establishment in Grapevine, TX we’re sure we’ll see you again next weekend! Stop in tonight! !